Bob Cury at RJC Yachts sends word that Raymond Young has taken over the central agency listing for the 2012 27.4m Ocean Alexander motor yacht, Lucy Belle. 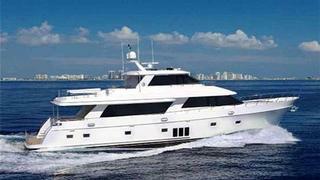 She's virtually new with only 350 original hours on her twin MTU 10V 2000 engines. Additional highlights include zero speed stabilisers, upgraded 55KW Kohler gen sets, ABT bow and stern thrusters and a Jacuzzi tub on the bridge. She also features a custom interior with Sapele joinery throughout along with marble and granite. A four-stateroom layout along with separate crew quarters aft provide accommodation for eight guests and three crew. Lucy Belle is asking $6,295,000.